Hiking in running shoes is nothing new. We started using Nike and Adidas runners on day hikes when we were preparing the second edition of the Canadian Rockies Trail Guide. As they say, one pound saved on your feet equals 10 pounds in your pack. On one occasion, we were coming off a 160-km backpack when the weather turned hot. Hiking boots were burning up our feet, so we strapped our boots on top of our packs and switched into lightweight running shoes we’d been carrying as camp slippers. The final two days of the trip were pure heaven as we scampered back to civilization (covering 35 km in one memorable day). But somewhere along the way I stopped using running shoes on the trail, probably when lightweight Gore-Tex hiking boots came along. The promise of drier feet and better under-foot protection from stones was more attractive than simply saving weight. Over the past decade, “minimalist” shoes touting “barefoot” technology became the rage (my aging body had no problem ignoring that movement). But last year a new line of running shoes caught my eye—the Hoka One One. Developed in France for ultra-marathon runners, these shoes are a quantum shift from “minimalist” to “maximalist,” boasting 2.5 times more cushioning than standard runners. After the brand’s introduction into North America in 2010, ultra-marathoners began switching to Hokas in droves. And my online research indicates many other folks are using Hokas for road running and day hiking. With the exception of a few cynics who view the shoes as just another fad, everyone who tries them seems to extol their virtues—glue-like traction on rocky downhill trails, exceptional shock absorption for tired limbs and injured knees, unmatched protection from underfoot stones and rocks. I’ve been hiking, street-walking and jogging in Hokas most of this spring, and I agree that they provide all of the above benefits. Despite their larger footprint (some folks compare them to wearing clown shoes), they only weigh a slight bit more than standard runners. I expected a lot of instability due to the thick, cushioned soles, but they are remarkably stable with little “roll” (you wouldn’t want to do much side-hill gouging in them). And rocky terrain underfoot virtually disappears. To paraphrase one reviewer, they are like monster trucks that roll over most obstacles without tipping over. I’ve completed just over 100 km in my Hokas, mostly on trail, so I can’t make any definitive statements about long-term wear (soles still look good). But I do feel guilty when I grab them for an outing instead of my low-cut Merrell Moabs or high-top Solomon Quest 4Ds (former favourites). 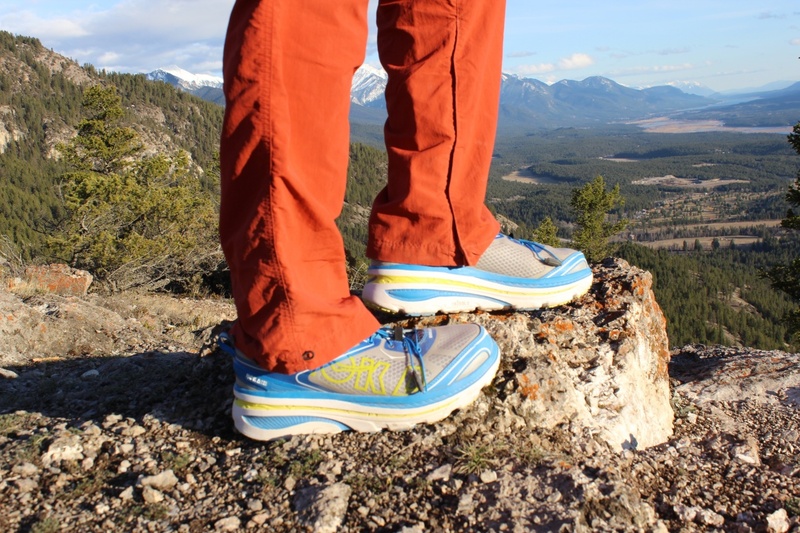 As I speak, a number of other brands are jumping on the bandwagon with super-cushioned runners and trail shoes (Altra, Brooks, New Balance, Vasque), but none have taken the technology as far as Hoka One One. I have a sneaking suspicion that the “maximalist” revolution, in one form or another, is going to have the same impact on hiking that suspension-rigged mountain bikes did for trail cycling.